This article is about the British dynastic order of knighthood. For other uses, see Order of Saint Michael (disambiguation) and Order of St. George (disambiguation). The Most Distinguished Order of Saint Michael and Saint George is a British order of chivalry founded on 28 April 1818 by George, Prince Regent, later King George IV, while he was acting as regent for his father, King George III. It is named in honour of two military saints, St Michael and St George. The Order of St Michael and St George was originally awarded to those holding commands or high position in the Mediterranean territories acquired in the Napoleonic Wars, and was subsequently extended to holders of similar office or position in other territories of the British Empire. It is at present awarded to men and women who hold high office or who render extraordinary or important non-military service in a foreign country, and can also be conferred for important or loyal service in relation to foreign and Commonwealth affairs. It is used to honour individuals who have rendered important services in relation to Commonwealth or foreign nations. People are appointed to the Order rather than awarded it. British Ambassadors to foreign nations are regularly appointed as KCMGs or CMGs. For example, the former British Ambassador to the United States, Sir David Manning, was appointed a CMG when he worked for the British Foreign and Commonwealth Office (FCO), and then after his appointment as British Ambassador to the US, he was promoted to a Knight Commander (KCMG). It is the traditional award for members of the FCO. The Order's motto is Auspicium melioris ævi (Latin for "Token of a better age"). Its patron saints, as the name suggests, are St. Michael the Archangel, and St. George, patron saint of England. One of its primary symbols is that of St Michael trampling over and subduing Satan in battle. The Order is the sixth-most senior in the British honours system, after The Most Noble Order of the Garter, The Most Ancient and Most Noble Order of the Thistle, The Most Illustrious Order of St Patrick, The Most Honourable Order of the Bath, and The Most Exalted Order of the Star of India. The third of the aforementioned Orders—which relates to Ireland, no longer fully a part of the United Kingdom—still exists but is in disuse; no appointments have been made to it since 1936. The last of the Orders on the list, related to India, has also been in disuse since that country's independence in 1947. The Prince Regent founded the Order to commemorate the British amical protectorate over the Ionian Islands, which had come under British control in 1814 and had been granted their own constitution as the United States of the Ionian Islands in 1817. It was intended to reward "natives of the Ionian Islands and of the island of Malta and its dependencies, and for such other subjects of His Majesty as may hold high and confidential situations in the Mediterranean". In 1864, however, the protectorate ended and the Ionian Islands became part of Greece. A revision of the basis of the Order in 1868, saw membership granted to those who "hold high and confidential offices within Her Majesty's colonial possessions, and in reward for services rendered to the Crown in relation to the foreign affairs of the Empire". Accordingly, numerous Governors-General and Governors feature as recipients of awards in the order. In 1965 the order was opened to women, with Evelyn Bark becoming the first female CMG in 1967. 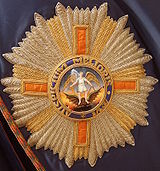 The Order originally included 15 Knights Grand Cross, 20 Knights Commanders, and 25 Companions but has since been expanded and the current limits on membership are 125, 375, and 1,750 respectively. Members of the Royal Family who are appointed to the Order do not count towards the limit, nor do foreign members appointed as "honorary members". The Order has six officers. The Order's King of Arms is not a member of the College of Arms, like many other heraldic officers. The Usher of the Order is known as the Gentleman or Lady Usher of the Blue Rod. Blue Rod does not, unlike the usher of the Order of the Garter, perform any duties related to the House of Lords. The mantle, worn only by Knights and Dames Grand Cross, is made of Saxon blue satin lined with crimson silk. On the left side is a representation of the star (see below). The mantle is bound with two large tassels. The collar, worn only by Knights and Dames Grand Cross, is made of gold. It consists of depictions of crowned lions, Maltese Crosses, and the cyphers "SM" and "SG", all alternately. In the centre are two winged lions, each holding a book and seven arrows. 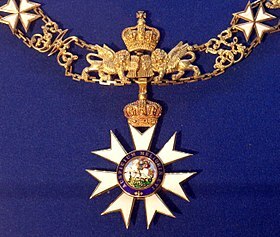 The star is an insignia used only by Knights and Dames Grand Cross and Knights and Dames Commanders. It is worn pinned to the left breast. The Knight and Dame Grand Cross' star includes seven-armed, silver-rayed 'Maltese Asterisk' (for want of a better description—see image of badge), with a gold ray in between each pair of arms. The Knight and Dame Commander's star is a slightly smaller eight-pointed silver figure formed by two Maltese Crosses; it does not include any gold rays. In each case, the star bears a red cross of St George. In the centre of the star is a dark blue ring bearing the motto of the Order. Within the ring is a representation of St Michael trampling on Satan. The badge is the only insignia used by all members of the Order; it is suspended on a blue-crimson-blue ribbon. Knights and Dames Grand Cross wear it on a riband or sash, passing from the right shoulder to the left hip. Knights Commanders and male Companions wear the badge from a ribbon around the neck; Dames Commanders and female Companions wear it from a bow on the left shoulder. The badge is a seven-armed, white-enamelled 'Maltese Asterisk' (see Maltese Cross); the obverse shows St Michael trampling on Satan, while the reverse shows St George on horseback killing a dragon, both within a dark blue ring bearing the motto of the Order. On certain "collar days" designated by the Sovereign, members attending formal events may wear the Order's collar over their military uniform or morning wear. When collars are worn (either on collar days or on formal occasions such as coronations), the badge is suspended from the collar. All collars which have been awarded since 1948 must be returned to the Central Chancery of the Orders of Knighthood. The other insignia may be retained. The chapel of the Order of St Michael and St George in St Paul's Cathedral, London. The original home of the Order was the Palace of St. Michael and St. George in Corfu, the residence of the Lord High Commissioner of the Ionian Islands and the seat of the Ionian Senate. 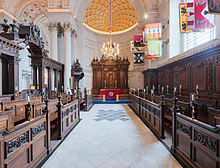 Since 1906, the Order's chapel has been in St Paul's Cathedral in London. (The Cathedral also serves as home to the chapels of The Most Excellent Order of the British Empire and the Imperial Society of Knights Bachelor.) Religious services for the whole Order are held quadrennially; new Knights and Dames Grand Cross are installed at these services. The Sovereign and the Knights and Dames Grand Cross are allotted stalls in the choir of the chapel, above which their heraldic devices are displayed. Perched on the pinnacle of a knight's stall is his helm, decorated with a mantling and topped by his crest. Under English heraldic law, women other than monarchs do not bear helms or crests; instead, the coronet appropriate to the dame's rank, if there is one, is used. Above the crest or coronet, the stall's occupant's heraldic banner is hung, emblazoned with his or her coat of arms. At a considerably smaller scale, to the back of the stall is affixed a piece of brass (a "stall plate") displaying its occupant's name, arms and date of admission into the Order. Upon the death of a Knight, the banner, helm, mantling and crest are taken down. The stall plates, however, are not removed; rather, they remain permanently affixed somewhere about the stall, so that the stalls of the chapel are festooned with a colourful record of the Order's Knights and Dames Grand Cross since 1906. The reredos within the chapel were commissioned from Henry Poole in 1927. Knights Grand Cross and Knights Commanders prefix "Sir", and Dames Grand Cross and Dames Commanders prefix "Dame", to their forenames. Wives of Knights may prefix "Lady" to their surnames, but no equivalent privilege exists for husbands of Dames. Such forms are not used by peers and princes, except when the names of the former are written out in their fullest forms. Furthermore, honorary (foreign) members and clergymen do not receive the accolade and thus are not entitled to use the prefix "Sir" or "Dame". Knights and Dames Grand Cross use the post-nominal "GCMG"; Knights Commanders and Dames Commanders use "KCMG" and "DCMG" respectively; Companions use "CMG". Knights and Dames Grand Cross are also entitled to receive heraldic supporters. They may, furthermore, encircle their arms with a depiction of the circlet (a circle bearing the motto) and the collar; the former is shown either outside or on top of the latter. Knights and Dames Commanders and Companions may display the circlet, but not the collar, surrounding their arms. The badge is depicted suspended from the collar or circlet. Woolley: In the [civil] service, CMG stands for "Call Me God". And KCMG for "Kindly Call Me God". Hacker: What does GCMG stand for? Woolley (deadpan): "God Calls Me God". Ian Fleming's spy, James Bond, a commander in the Royal Navy Volunteer Reserve (RNVR) was fictionally decorated with the CMG in 1953. (This is mentioned in the novels From Russia, with Love and On Her Majesty's Secret Service, and on-screen in his obituary in Skyfall.) He was offered the KCMG (which would have elevated him from a Companion in the Order to a Knight Commander in the Order) in The Man with the Golden Gun, but he rejected that offer as he did not wish to become a public figure. Dame Judi Dench's character "M" is "offered" early retirement and a GCMG in Skyfall after a series of unfortunate events resulting in the loss of a list that named every NATO espionage operative. Long-time Doctor Who companion Brigadier Lethbridge-Stewart wore the ribbon of the order as the highest of his decorations in the series' classic era. Riband, badge and star of a GCMG worn by Lord Tweedsmuir. ^ a b c d Duckers, Peter (2009) . British Orders and Decorations. Oxford: Shire Publications. pp. 26–27. ISBN 978-0-7478-0580-9. OCLC 55587484. ^ a b c d e f The Royal Household (2009). "Order of St. Michael and St. George". The Official Website of the British Monarchy. London: Crown Copyright. Archived from the original on 27 February 2009. Retrieved 25 April 2016. ^ Townsend, Francis (1828). Calendar of Knights. 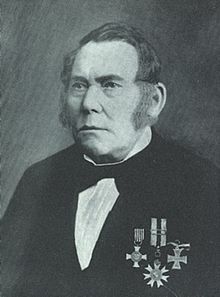 William Pickering. p. 206. ^ "Knights/Knighthoods genealogy project". geni_family_tree. Retrieved 30 June 2017. ^ Henry POOLE 1873–1928 (Tate Britain); retrieved 1 October 2009. ^ Cross, Colin (1968). The Fall of the British Empire. London: Book Club Associates. ^ "H.K. 's ex-No. 2 leader Anson Chan honored by Queen Elizabeth". Findarticles. 11 November 2002. Archived from the original on 10 July 2012. Retrieved 18 October 2009. ^ "Sabah Dynasty". Royal Ark. Retrieved 8 September 2013. ^ "Honorary awards" (PDF). Retrieved 30 June 2017. ^ "Hoge Britse ridderorde voor De Hoop Scheffer" (in Dutch). ^ "Honorary British Awards to Foreign Nationals – 2014". Archived from the original on 16 October 2014. ^ a b c "Honorary British Awards to Foreign Nationals – 2015" (PDF). Wikimedia Commons has media related to Order of St Michael and St George. "Knighthood and Chivalry", (1911). Encyclopædia Britannica, 11th ed. London: Cambridge University Press. Orans, L. P. "The Most Distinguished Order of Saint Michael and Saint George"
Velde, F. R. (2003). 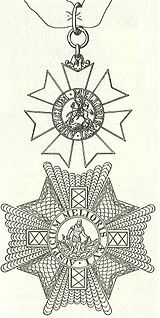 "Order of Precedence in England and Wales"
State Library of New South Wales: Nelson Meers Foundation—gallery to full set of insignia, including images of both sides of the badge and a close-up of the star.